The world of private flight is a fascinating one full of luxury and impressive aircraft. 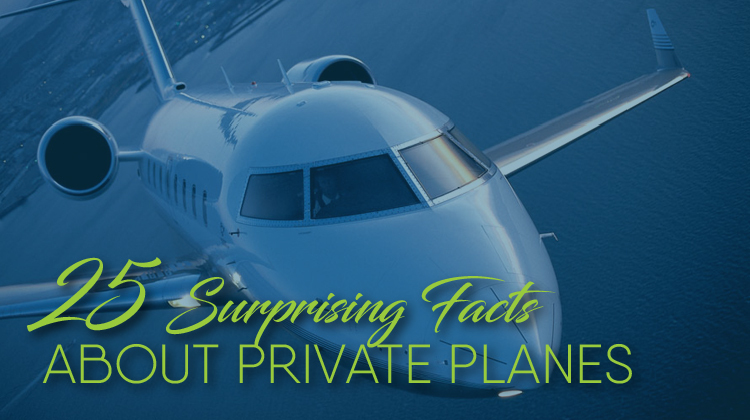 In this list, we take a look at 25 facts related to private planes that most people probably don’t know. The fastest civilian aircraft in the world is a private jet, the Cessna Citation X. The most expensive private jet in the world is worth a staggering $500 million. It is an Airbus A380 belonging to Prince Alwaleed bin Talal Al Saud. As many as 600 private jets fly in to attend the Super Bowl, making it the biggest event for private aircraft. In the US, private jets have access to roughly 5000 airports, while commercial airlines only around 500. A Gulfstream 550 has 226 cubic feet of luggage space. The US makes up nearly half the world’s private jet market. Harrison Ford has a collection of private aircraft – according to him, “more airplanes than it’s fair for anybody to have.” He was 52 years old when he started learning to fly planes. The world’s smallest piloted plane was the Bumble Bee II built by Robert Starr. It was an adorable 2.7 meters long and had a wingspan of 1.68m. The Bombardier Global 8000 can go 9091 miles on a single tank of fuel. The change in air pressure on a flight can numb up to a third of your taste buds. The price tag for chartering a Gulfstream V for a weekend from New York City to San Francisco: $100,000. Donald Trump’s Boeing 757-200 airliner-turned-private-jet features gold-plated fixtures, including a master bath with 24-karat gold accents. The first corporate airplane in America was “Smilin’ Thru”, a Travel Air Model 6000-B built by Harry L Ogg, then president of the Automatic Washer Company. As part of Ogg’s marketing efforts, the plane would sometimes carry up to four washing machines. The odds of dying in a car accident are 1 in 5,000; the odds of dying in a plane crash are roughly 1 in 1 million. Chuck Yeager piloted the flight that broke the sound barrier with two broken ribs (he’d fallen off a horse two nights prior). A large jet can burn around 32 litres of fuel per minute. John Travolta is an accomplished pilot and owns at least five aircraft, including a Boeing 707-138 that previously flew for Qantas. Three of the most expensive airports to land in are in Japan: Kansai International Airport in Osaka ($5,400), Narita International Airport in Tokyo ($5,600), and Haneda Airport in Tokyo ($6,850). Showbiz personalities who own private jets include Oprah Winfrey, Jay-Z, Tom Cruise, Jackie Chan, and Angelina Jolie. Beyoncé gave husband Jay-Z a 40 million-dollar Bombardier Challenger 850 jet as a Father’s Day present. 30% of private jet owners say they would purchase a new one in 5 years. The plane that crashed tragically in 2016 leading to the demise of 71 people, including most of Brazilian team Chapecoense, ran out of fuel a mere 8 miles from its destination. The first Learjet 23, first flown in the early 60s, is on view at the Smithsonian Air & Space Museum. In 2012, NetJets aircraft logged a total distance of 110,585,785 nautical miles, equivalent to 266 round trips to the moon. Over 11,000 private jets were registered in the US, compared to around 8,000 in the rest of the world.